The Antofagasta Region is the heart of the mining industry, Chile’s main source of export revenue. It represents 53% of Chile’s mining output, led by copper and followed by potassium nitrate, gold, iodine, and lithium. The mining industry accounts for 93.7% of the region’s exports. It is the second-largest region in Chile, rich in landscapes, culture, and contrasts: the blue of the Pacific Ocean bathes its 500-kilometer coastline and beaches while, in the interior, the reddish hues of the Atacama Desert enfold ancient settlements, intriguing valleys, and vestiges of cultures that existed thousands of years ago. Most of the population lives on the coast in Antofagasta and Mejillones, or in Calama in the interior, the hub of the mining industry and the home of a large part of its work force. All three towns are closely linked to the development of mining and related financial, port, energy, and service activities. This region became part of Chile following the War of the Pacific. Antofagasta is known as the world’s “copper capital.” Most of the main international copper companies have offices there, as do the leading suppliers of services for the industry. Demand for supplies and services alone amounts to around 1.5 billion USD per year. Chile’s largest copper producer, the State-owned National Copper Corporation (CODELCO), has its main center of operations in Antofagasta. In recent years, CODELCO has accounted for over 18% of Chile’s exports, close to 4% of its GDP, and, on average, 8% of total fiscal revenue. This region, however, does not only extract wealth from its subsoil. In addition to its manufacturing, industry and mining-related services, there is a fishing industry –accounting for 12.5% of the national fishery output –, construction, and tourism, as well as scientific activity focusing on astronomy. A major concern of the authorities is to foster Latin American integration. The Integration Zone of West Central South America (ZICOSUR) is designed to strengthen three bi-oceanic corridors connecting the Pacific and the Atlantic, helping to project the region towards Asia-Pacific markets. The most important is the Capricorn Corridor, which, through the Jama and Sico Passes, connects the Chilean ports Antofagasta, Tocopilla, Mejillones, Taltal, and Chañaral with Argentina’s Jujuy and Salta provinces, ending in Curitiba, Santos, and Paranaguá in Brazil. The availability of infrastructure and services, due to the region’s mining boom, together with its abundance of beautiful natural scenery, have opened vast prospects for the travel industry, both in the interior and on the coast. One place that attracts visitors all year round is San Pedro de Atacama, a small town 2,438 meters above sea level. This was once the center of the Atacameño culture and is characterized by narrow streets, a beautiful square shaded by ancient pimentos, or allspice trees, and adobe houses roofed with straw. Today, San Pedro is considered the country’s principal archaeological center. Its Archaeological Museum houses an important collection of Atacameño exhibits. It is now managed by the Universidad del Norte, but the collection was started by Father Gustavo Le Paige, a Belgian who arrived there as parish priest in 1955. One of the most remarkable items is a female mummy – popularly known as “Miss Chile” – that was found in the desert in excellent condition, with even its hair intact. Close to San Pedro are the Atacama Salt Flat, the Valley of the Moon, the Quitor Pukará, and the Puritama hot springs. At a distance of 65 kilometers and an altitude of 4,500 meters above sea level, the boiling-water geysers at El Tatio must be visited at sunrise. Lake Chaxa, in the middle of the Atacama Salt Flat, where parinas (pink flamingoes) nest, is a protected site. Opposite San Pedro is Mt. Licancabur, a cone-shaped volcano (5,916 meters). Some distance to the south, Mt. Láscar (5,154 meters) is a very active volcano. The Antofagasta Region has a remarkable number of astronomical observatories. The Very Large Telescope (VLT), the largest telescope in the world, belonging to the European Southern Observatory (ESO), started operations in 2003 on the summit of Mt. Paranal, at 2,635 meters above sea level, in the middle of the Atacama Desert. The facility, which represents a total investment of US$750 million, has four 8.2-meter primary mirrors, capable of working jointly or separately, and three ancillary telescopes, each of 1.8 meters. On the Chajnantor plateau, inland from San Pedro de Atacama, at an altitude of 5,000 meters, the radio telescopes of the Atacama Large Millimeter Array (ALMA), a project sponsored by the main U.S. and Canadian astronomy centers through Associated Universities, and ESO, are already being installed. 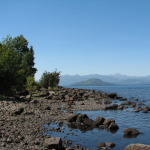 The project will be built on 17,000 hectares of land, transferred for 50 years under a concession from the Chilean government, and is expected to be fully operational by 2011. With an estimated investment of US$555 million, the project involves building 64 antennas, each 12 meters in diameter, simulating a radio telescope 14 km in diameter, with a resolution 100 times higher than any instrument currently in operation. It will permit the detection of galaxies and planets in the cold regions of the universe, and observation of areas that are darkened by interstellar dust.